Borderlands 2 will focus on story and variety to tempt you back to Pandora for a second adventure. With a full game and four separate packs of significant DLC currently at your disposal, it's pretty clear that Borderlands has been a non-stop avalanche of content for fans of the series since it's initial release in 2009. Now, three years after we first learned to navigate the lands of Pandora from that rascally little robot Claptrap, Gearbox Software has decided to start fresh with Borderlands 2 a new adventure that maintains basically every single thing that defined the original as a self-proclaimed "shooter RPG" ... for better or worse. Gearbox paired me with one other player, and let us choose between two classes for a demo. I took the Siren (my class of choice during my experiences with the original Borderlands) while he took the Gunzerker, a beefy assault trooper type with a cow-catcher beard of which I was immediately jealous. Both of us were set up with one basic power: I could lift enemies into the air, helplessly levitating them for a short time, while my brother-in-arms (note the plural) could dual wield two completely different weapons simultaneously for some devastating effect combinations. It wasn't long before enemies swarmed us, which may be the largest difference between Borderlands 1 and 2. There weren't many moments during this new experience when I wasn't covered in a decent variety of unforgiving baddies, which kept the pacing fun and my fingers busy. The only downside to the hectic action, if there was one, was that it left my partner and I a bit out of sync. There were multiple times when we both traveled a chain of assaulting enemies in different directions, and then had to struggle to fight our way back toward each other. Based on the physical set up of the PAX demo, we couldn't speak to each other easily (which would be different in the actual game), so that may have been more to blame for our lack of teamwork than a design issue. The enemies themselves were more varied than the 763 different types of skags you seemed to encounter 90% of the time in the first game, which was immediately refreshing. They also look crisper, as does the game as a whole, really punching up its distinct cell-shaded style with better colors and a sharper contrast to the background. Combat is similar to the first, but new, slight variations between weapons and enemy types have been added to spice things up. The bug-like enemies we fought for our preview, for example, often had weak spots, requiring a small sequence of actions to defeat: a "shoot the hot-spot, bust up the armor, and take it down" sort of thing. There will be some other tricks at work in the final game, too. For example, some enemies will buzz around for a bit, but enter a cocoon that makes them more difficult to kill if you didn't prioritize toasting them in their initial, more larval state. Guns employ the same addition of unique quirks, and while Borderland's weapons have always been known for their variety, this time the manufacturing brand (Atlus, Hyperion, and the like) matters. Each gunsmith has a wholly different look and feel, boons and drawbacks. These variations, combined with the different styles of enemies, has created a combat system that, while very similar to the first Borderlands, somehow feels more active and involved. After my demo, I had a chance to speak with creative director, Paul Hellquist, and ask him what additions the team had made to improve the Pandora experience. Hellquist answered that Gearbox had focused on player feedback, trying to recreate the experience that brought people into the zany shooter three years ago while retuning certain aspects with which players had taken issue. Most of the improvements were fun additions like added shield types, grenade types, and a new vehicle (with completely revamped physics) that can seat all four players and launch buzz saws. Hellquist also mentioned the issue of enemy variety, and how the largest shift of enemy types in Borderlands 1 came too late in the game. This time, he said, each area will host its own unique "family" of enemies, making sure that each section maintains a new feel and challenge. 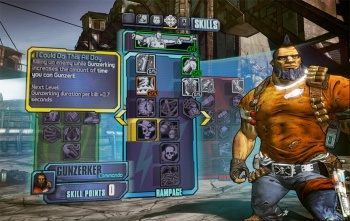 Each character in Borderlands 2 still evolves based on three separate skill trees, but Hellquist was excited to explain that now, each tree can reach two points that he described as "game changers," abilities which fundamentally alter how the character plays. One of these, he explained, will be reached mid-game, while the second will come toward the end. Based on my ten-minute experience with Borderlands 2, I think it fair to say that if you played the original, then you already know almost exactly what to expect with its sequel. Things look cleaner, the pacing is improved, and the action is more frenetic. Otherwise? It's Borderlands. And if you liked Borderlands, that's far from bad news.